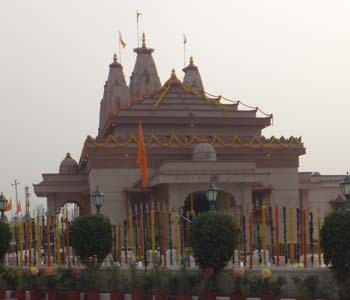 Shivji Temple At Alpha International City Karnal, India. 703/A, Landsend, Lokhandwala Complex, Andheri – (W), Mumbai – 400053. Alpha Temple is located in religious plot in Alpha International City, a Township at Karnal in the state of Haryana on land measuring approx. 350 Acres. The plot is with road at North side, which is auspicious for temple project. Slope of plot will be down towards North direction (Road side). Shape of plot is Gomukhi (Cow’s head shaped). We have designed every structure as per Temple Architecture and Vastu Shastra. We have designed following strucyures in this plot. Deities – 3 nos. of Deities with three separate Garbhagrihas (Sanctums) for Sri. Shivji, Sri. Radha Krishna, and Sri. Hanumanji. We have planned Shivlinga in centre Garbhagriha, Sri. Radha Krishna at Right and Sri Hanumanji at Left of Main Sanctum. Centre Garbhagriha is 10’ x 10’ in size to accommodate Shivlinga and side Garbhagrihas’ are 6’ x 6’ in size. Statue of Sri. Nandi is placed in Main Garbhagriha at North side of Shivlinga. All the Deities in our temple will like to have facing at East. East side facing is preferable, so Temple is planned East facing. Shivlinga at centre of Garbhagriha. Sri. Radha Krishna: Sri. Krishna Playing Flute and dancing with Mata Radha. Sri Hanumanji: at Right in standing position. Nandiji in front of Sri. Shivji in seating position. Every Garbhagriha entrance will have statues of respective Dwarpals (Door Guards) carved in walls. Temple Sabha Mandap (Satsanga Hall) will have 3 nos. of entrances; main entrance from East other from North and South direction. Main entrance – East side is for all devotees, North entrance for VIPs’ at time of Puja & festivals and South entrance is for Pujari other Sevadharies (people working in temple) to enter for cleaning temple flooring, giving bath to Deities, offering Prasad (Food) to Deities etc. All three entrances have entrance porches of 9’-3”’ X 6 ’ size with a round dome over ceiling slab and artistic carved columns with round arches carved in Pink & Red sand stones. Satsang hall size 26’-6” x 26’-6”’ X 12’ high will be one step higher to entrance Porch, will have area of 700 sft which is sufficient for 70 to 80 devotees seating or 100 devotees in standing position while praying; This Hall will have one pyramid shaped dome roof which will generate energy in Devotees body while praying. Sufficient natural lighting and ventilation is given for hall and Garbhagriha. One raised platform of size 30” high will be provided in every Garbhagriha for keeping Deities statues. Provision of mike, speaker and lights for Satsanga (Religious Musical programs) performances will be made in Hall. Pink and Red colored sand stone cladding designed from all exterior sides and all Domes / Shikhars. Design of exterior art work is Sangam (combination) of all types of Indian Temple architecture. Main Shikhar as North-West type, Sabha Mandap pyramid is of North-East type, Entrance half round domes, projected chajjas, window jalis & chajjas, (Zaroka) as Jaipur style of architecture and some of relief work details / motifs will be south Indian architecture style. All these details are blended / combined together to show complete Hindu (Indian) Temple architecture beautifully. Interior of Saba Mandap and Satsang hall will be artistically designed, carved and done in white marble. All walls will have many religious motifs. False ceiling is designed artistically in plaster of Paris material. Electrical light fittings and music system will also have an important role in this temple Vastu. Height of Main Shikhar with Kalash is 41 feet and side Shikhars is 36 Feet. Many other details come along with positive waves and inspiration while executing the temple work. 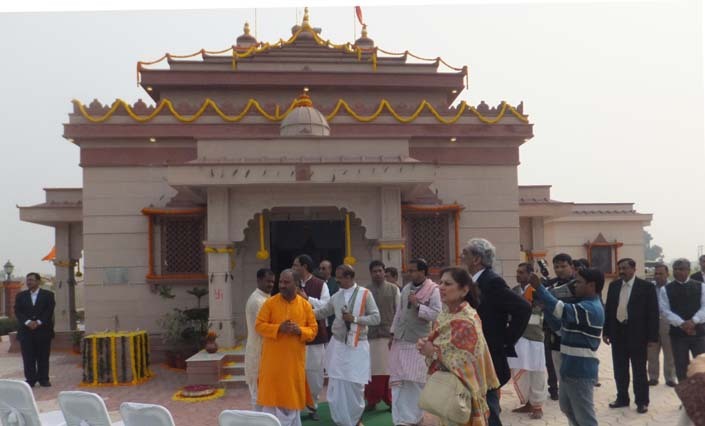 Design of Entrance Gate and compound landscape is designed in such a way that, it will create spiritual atmosphere in and around the temple Vastu (structure) so that devotes will bow his head with respect while entering the temple. 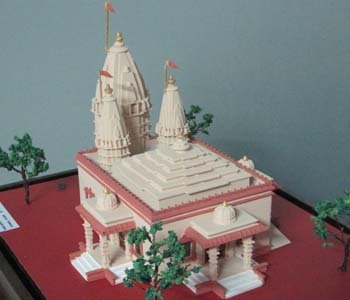 One small structure with a hall, kitchen and toilet is provided for Pujari who is taking care of Temple. A small block with Ladies and gents toilet is provides at rear side of temple, so it will not be visible from road side. It is only for devotees praying in temple. All these structures will match suitably with temple Structure. We are fully sure that the dream project of company will fulfill all good wishes and give complete satisfaction to owner and staff of this company M/s. Alpha G Corp.